Lineman pliers, also known as side cutting pliers, is a tool for cutting cable and wire. You can also use them for twisting, straightening, gripping, and bending a wire.They are an essential in every lineman's toolbox and handy in home toolboxes. For whatever purpose you need them, whether for home or professional use, you should consider a few factors before buying them. 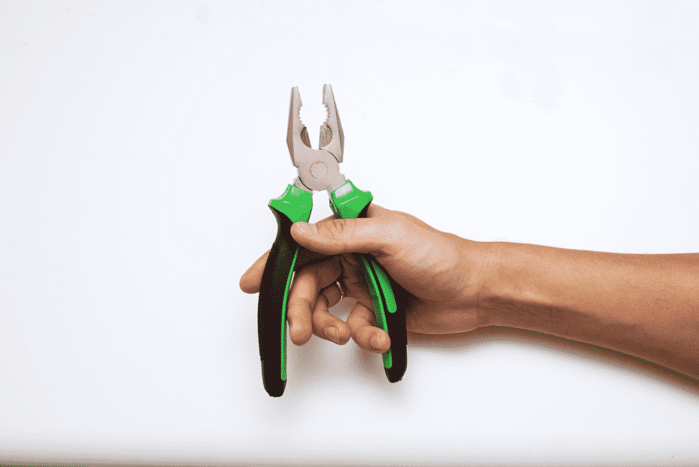 If you are a professional, you will definitely want the best lineman pliers in your toolbox. What materials are the pliers made of? How's the grip of the pliers? How’s the cutting edge of the pliers? What are the features of the pliers? Do they meet certain standards? How much should I spend on good pliers? Another very reliable brand for tools is Klein Tools. They cater more for the professionals, which means they are tough, durable, and long-lasting. The Klein D213-9NE is a high leverage side cutting pliers is a great reflection of their quality. They are very straightforward but you can really tell that special attention was put in every part of the tool. What stands out with these pliers from others is that it uses high-quality tool steel with induction hardened edges for great strength and sharpness. It is also constructed with a hot-riveted joint that makes the use of the tool smooth and easy. Lastly, the handles are dipped in plastic which offers comfort and a full grip. Overall, the construction is great and gives you great value for the money. The tool steel is of great quality and highly durable. The details on the jaws provides a strong grip. The cutting-edge also stays sharp for a long time. Cutting with these pliers is smooth and easy. The handles are also very easy on the hands. They might be a little stiff at first, but after some time, it becomes very smooth. Not much attention to finishing. I think by now, you’ll notice that the best tools are from well-known and experienced manufacturers. Channellock is another one of the greats in the tool industry. However, among the big names, Channellock is best known for their pliers! The Channellock 369 is one of the best. It looks very simple but works like a beast! It’s made of high-carbon C1080 steel which is very high quality with laser-treated cutting edges. They are very durable and stay sharp longer. Its cutting edges also have a knife and anvil style which works great for mating and superior cutting. Lastly, the patterns on the jaws grips on objects very well. The overall features make this such a great option for professional use. They look dainty, especially because of the light color, and a tough pair. They cut thick cables and wires easily with regular force. Cuts ASCR, piano wire, and other hard wires easily. It doesn't require you to give greater force. The blue handle is easy on the hands and easy to spot. The knife and anvil edges allow you to cut cleanly and makes mating easier. The grip on the handle is not the most comfortable. Light blue color makes dirty handles very visible. This next option is from another popular manufacturer of mechanic tools—Stanley's tools. They've been in the industry of making and innovating tools for over a century now. This speaks of their commitment to their trade and they are reliable. The Stanley 8-inch bi-material lineman pliers are simple yet powerful and straightforward. The strong and durable drop-forged steel meets the ANSI standard specifications. They are great for those who won’t use pliers too often, for simple tasks at home and do-it-yourself projects. Good quality at such an affordable price. The handles are pretty easy on the hands. It offers a good grip and prevents slipping off. Great option for home projects. It became rusty very quickly, but not a huge problem. The cutting edges didn’t stay sharp for long. That said, it’s not the ideal pair for professional work. This list would not be complete without an entry from Knipex. It is another very popular manufacturer of tools that’s been around for a very long time. I have to say that they prioritize quality to the smallest details of their products. That said, the 9.5-inch high leverage lineman pliers are one of the best for professional use. These pliers are made of a very durable material, vanadium electric steel.The handles utilize Knipex Tools' Comfort Grip, which is very easy on the hands. As for the edges, they are induction hardened that claims to make cutting soft, hard, and ACSR wire easily. The jaws also have serrated patterns that allow for easy gripping and pulling. They’re easy on the hands. The bright-colored handles make them easy to spot. The jaws grip on cable and wire very well. Compared to others, it is the most expensive option. They are stiff out of the box. Irwin Tools is among the top manufacturer and distributor of high-grade hand tools and power tools. They've been in the trade for over a century, creating and innovating superior products. In fact, they stand behind their products by offering great warranties—a full lifetime guarantee and limited guarantee. Their 9.5-inch lineman's pliers is a great example of their good reputation. These pliers have induction-hardened cutting edges made of nickel chromium steel. It claims to be capable of cutting tough materials like ACSR (aluminum conductor, steel reinforced cables), screws and piano wires. It also describes to have a superior rust-resistant coating to make them last longer. This model actually comes in different varieties; some with additional purposes like the wire crimper or fish tape puller. However, if you’re just looking for basic pliers, these are an excellent choice. To me, the handles also feel very easy on the hands. The grip is molded with 3 different components which provide a great cushion for the hands. Made tough by the induction hardening process. The rust-resistant coating is pretty good. The handles are pretty comfortable in the hands and allow good control. Irwin Tools backs it up with their full lifetime guarantee. The handles are quite slim, which I think would be a challenge for larger hands. Cutting a thick cable (1/10 welding cable) is not as smooth as I want them to be. It requires more force. I would say they are better for home projects. 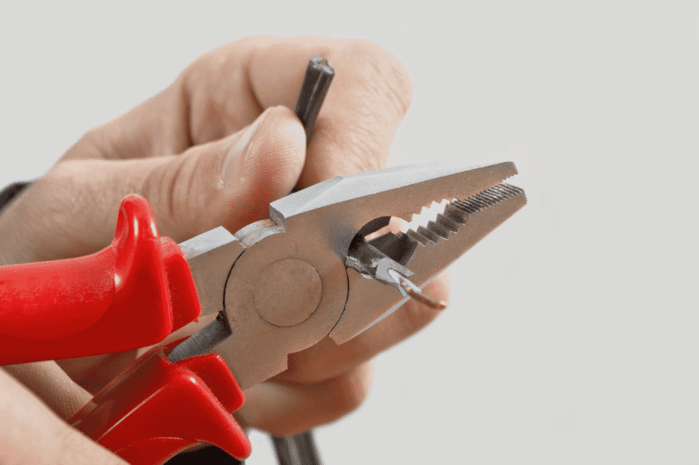 There are many different kinds of pliers, so why should you get lineman’s? Among the many different kinds of pliers, lineman's (also called side-cutting pliers) have multipurpose uses. They have a large head and big jaws which are usually serrated. The serration allows you to hold on to objects easily. Typically, lineman's pliers are for cutting, twisting, gripping, straightening, and bending the wire. The material of any tool is probably one of the best indicators of how durable it is. Thus, it is important to know what your lineman pliers are made of. Look into what kind of metal is used and what the handle is made of. Some metals are stronger and more durable than others. You also want to be mindful of corrosion in some metals. Most pliers use alloy steel and may have other components to make them stronger and to avoid corrosion. The difference in components will vary per manufacturer. Typically, high-quality pliers have a higher carbon content and elements like vanadium and chrome. These improve the strength of the metal. There is also something called tool steel, which is a variety of carbon and alloy steel that is designed to suit tools such as pliers. The grip or the handle of the pliers are essential because they determine how easy and comfortable the pliers are to use. If the grip is not right, the job will be more difficult and your hands will tire faster. You also don't want the tool to slip off your hands when you use them. When choosing pliers, it is important that you get a feel for the grip. Go to a physical store so you can try the different grips. See and feel them for yourself. Reading reviews and descriptions are not enough to determine what grip are good for you. Moreover, you should also check what the grip is made of. There are plastic grips, rubber grips, and plain metal ones. You should also check if they have non-slip features. Since lineman's pliers are typically used to cut wires and cables, it's only wise to choose one that has the high-quality cutting edge. Look out for cutting edges that are laser-treated. These tend to give you a long-lasting sharp edge. Some pliers have additional features for multipurpose use. For example, there are pliers with fish tape pullers and wire crimpers. There are also others that have more leverage. Lots of options can sometimes makes it confusing to choose. Usually, big brands are more expensive, but not so much with lineman pliers. You can get great pliers from a certain brand/manufacturer at an affordable price. In addition, the popular manufacturers are known for a good reason. Most of them (Klein, Irwin, Stanley’s, and more) have been in the industry for a long time. They are popular for being reliable, and durable, among many others. ANSI, which stands for the American National Standards Institute, provides standards to determine the performance level and safety of the tools. When you buy tools that meet or exceed these standards, you know you are getting good quality. Cost is always a factor to consider. Cheap pliers are rougher on the jaw surface and use simple materials on the metal and the handles. They might require more effort to use and the handles are not as comfortable than expensive ones. The expensive ones are more refined on the surface and edges and allow a smoother opening and closing. They are easier on the hands. It’s all about preference, but typically you can find pretty decent pliers under $20. Lineman pliers are straightforward so choosing should not be that difficult. There are just a few details you need to be bear in mind. Look into the materials, the construction, the cutting edge, and the handles. The rest should depend on what you intend to use them on. Some are better for home-use, while others are better for professional use. You can’t go wrong with any of the options on the list. However, my pick for my use would be Klein Tools High-Leverage Cutting Pliers. They are very tough and durable, even for professional use, and they have a reasonable price.